Hello amazing Friends! I have a fun little makeover for ya’ll today! Are you up for something fun?? I should have taken a picture of a soda can next to it so you can see how petite it is. It really can’t function well as a side table because it is just too small but I did like the shape of it. However, I decided to pass on it. A month later, I stopped in the same thrift store and it was still there, marked down to $3.98! Ok you got me…and in the cart it went. 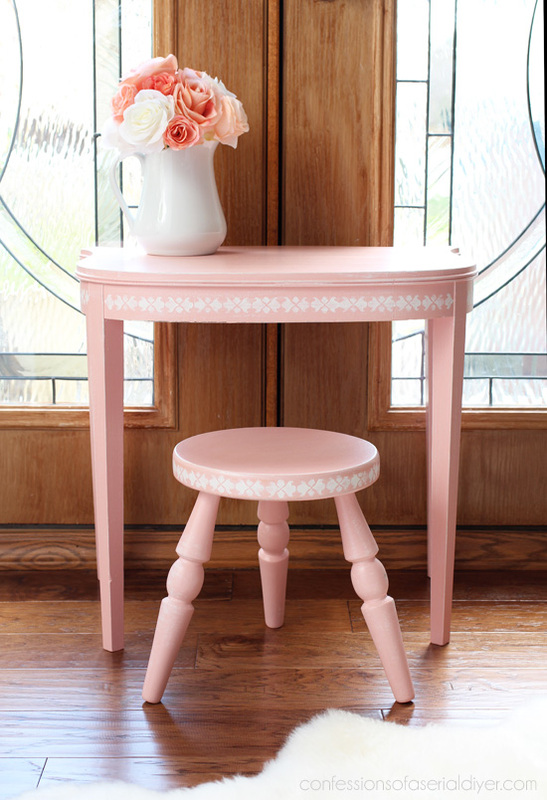 I decided it could be cute as a bedside table for a little girl’s room if nothing else. 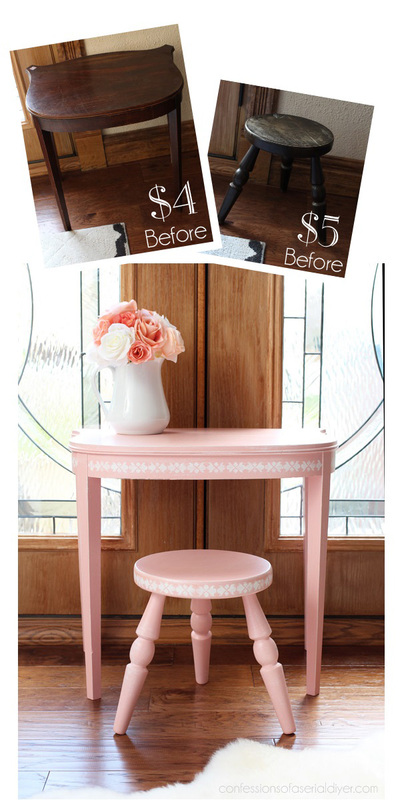 Were you thinking to turn it into the cutest little vanity set ever?? 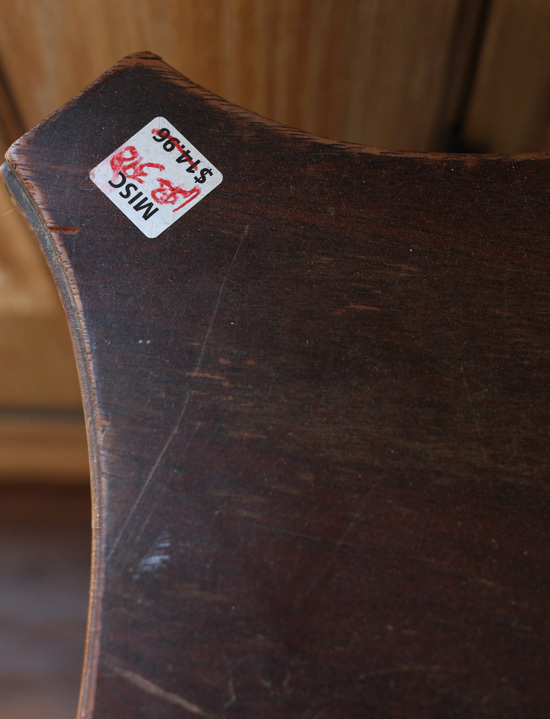 I had Brennan sit at it to test the height of the stool with the table and it was perfect. I’ve included a few affiliate links so you can find the products I use. I could just picture a sweet little girl sitting here coloring, or drawing her next masterpiece. And when she is too big for the set, the table can still function as a bedside table. This is another new color I picked out. 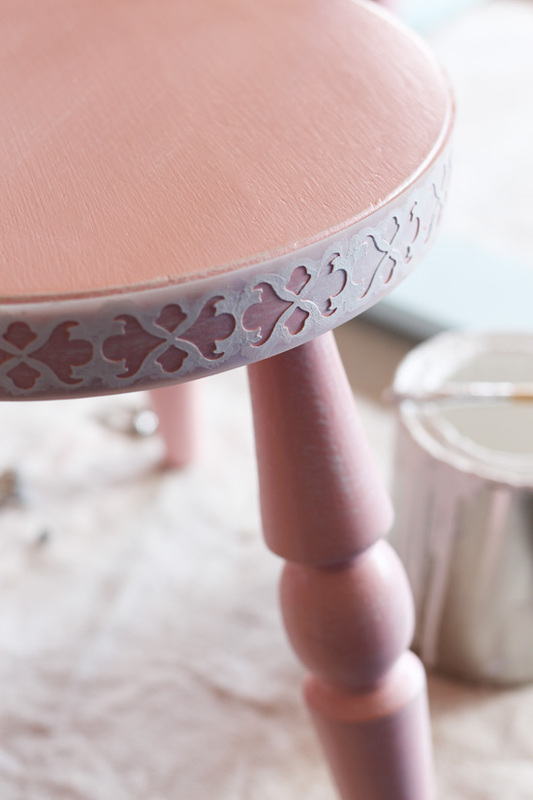 It is Taffy Twist by Behr that I made into DIY Chalk Paint. I love this color! As you can see I sanded it smooth once the wood filler was completely dry. I spray primed both pieces with Zinsser Bulls Eye spray primer since they were so dark, to hopefully save me from having to paint several coats. Two coats of paint did the trick. Instead of sanding to show the dark wood through the edges this time, I decided to dry brush the edges and across the top with Ultra Pure White DIY chalk paint. The stencil I used came from the set I used on this folding screen I shared recently. I used Loctite spray adhesive to hold the stencil in place. Then I used a small brush to fill in the stencil. 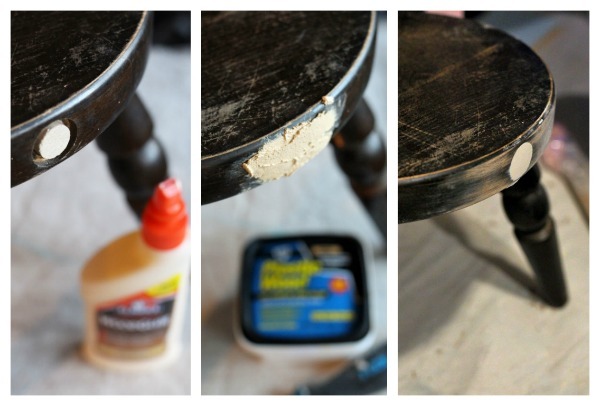 I did two coats with DIY Ultra White Chalk Paint. When it was dry I sanded the stencil smooth with 220 grit sand paper. I sealed with Polycrylic this time so this little set could take some abuse. 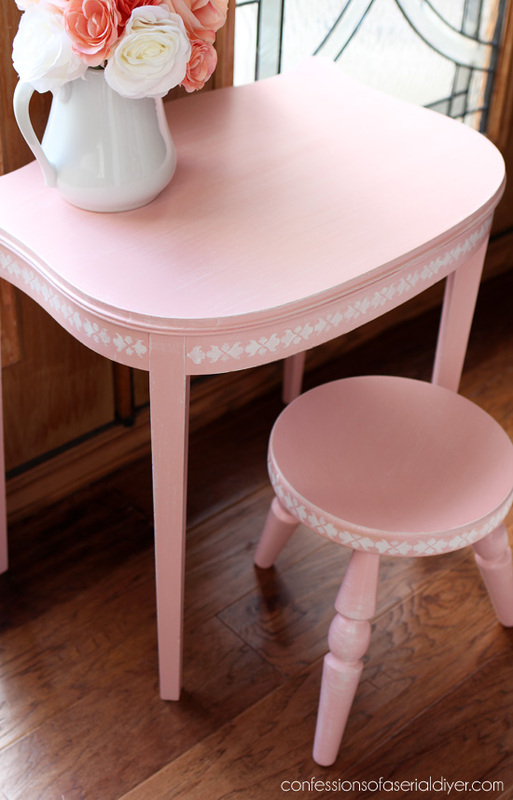 Perfectly petite for this little table. I told ya’ll this was a fun makeover! I just dropped this off at my booth on Friday. I was pretty much cleared out of furniture in January so I have a lot of painting to do! 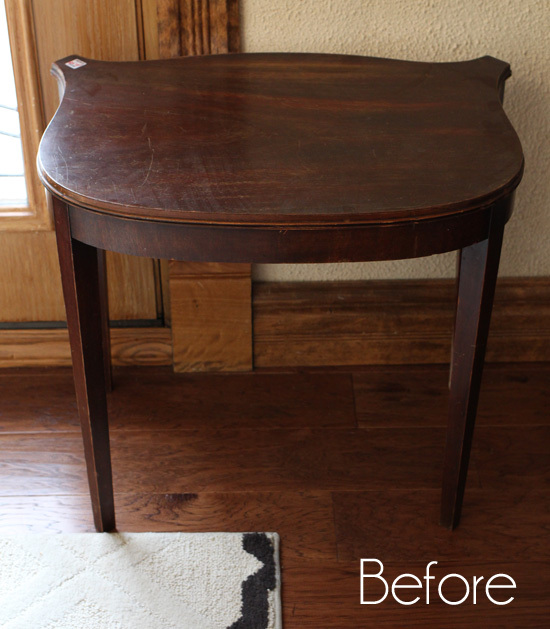 UPDATE: No need to wait…see how I updated this hutch HERE now! Oh the sweetest little set! You are amazing. Oh my I can’t wait for Thursday. 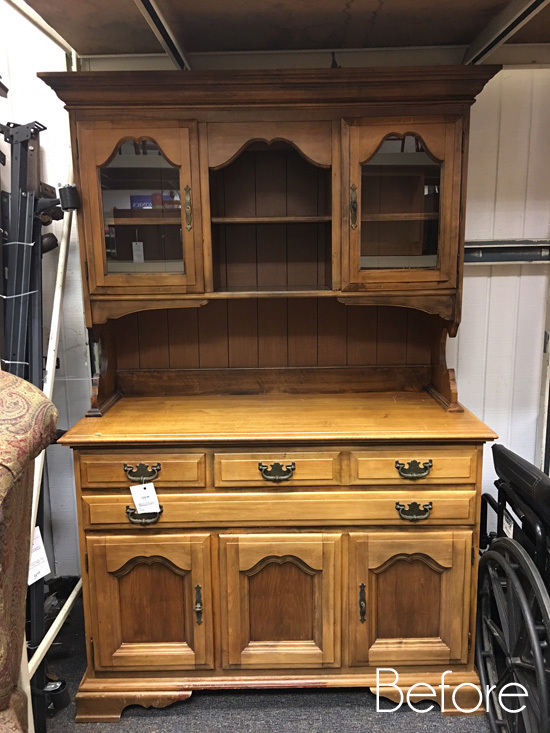 I love that hutch and I have been looking for one, that one is so perfect. SO jealous about your great finds. That is the sweetest thing ever. I was so surprised when I scrolled down and saw pink. 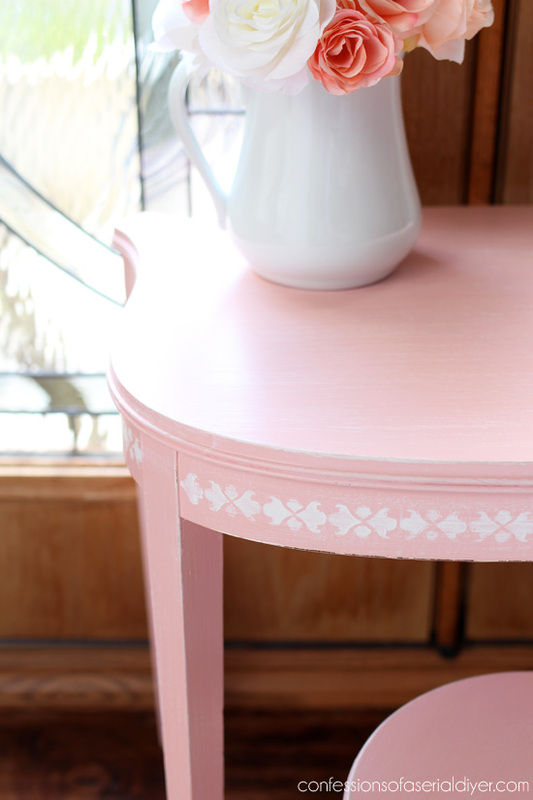 Such a pretty pink and the stencil was perfect where you placed it. Some little girl is going to be so lucky and bet it sells in your booth quickly. Can’t wait until Thursday to see what you do with the hutch. If I lived closer this would be coming home with me for my grandgirls! how precious is this ! love your work. Oh Christy, some little girl is going to be giddy happy with this cute set. 🙂 Lovely finds and perfect makeover. 🙂 Rockin’ it as always !! I love all your makeovers and this one is a very cute change from your usual looks! Hopefully it will sell right away! I love this! Great idea and well done. This will make a sweet little girl very happy. Oh how cute!! 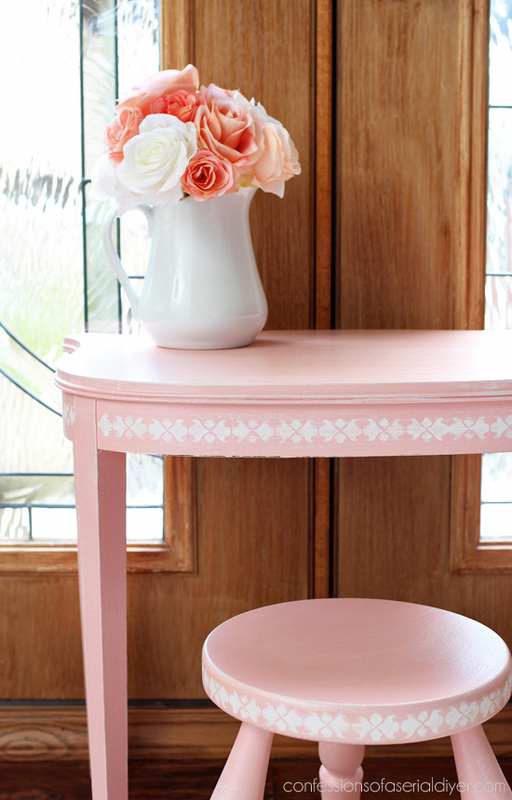 The color and the stenciling are just perfect. Some little girl is going to be thrilled to get that set. 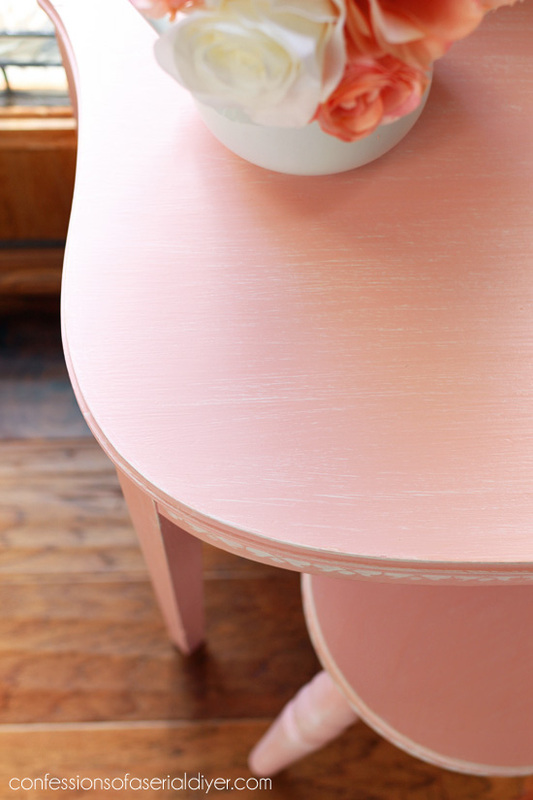 You’ve done a wonderful job updating and refurbishing your pieces. 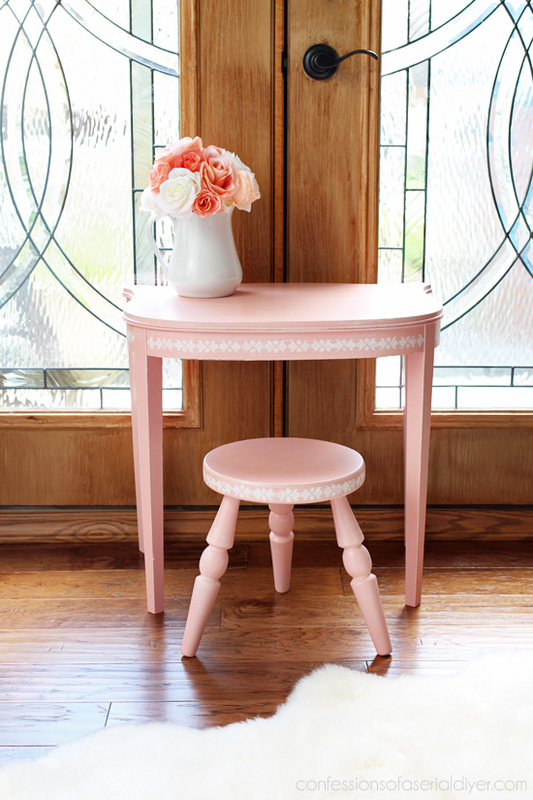 I love the little pink table and stool, the tool box tote, and that dresser done in sparkling white with the gold-tone handles. Excellent job! Keep on inspiring us readers. Isn’t that just the cutest makeover Christy, perfect color choice too! Love it. Wow , that certainly is cute! Great job! Would love to come across something like this to alter for my granddaughter! Christy, so sweet I have a toothache! I love your vision for revision! No, it never would occur to me to put those two together and create such a fabulous little set! Brilliant and adorable. The addition of the stencil makes it even sweeter. Thanks, Chris!! I have boys too, but if I had a girl…I think I’d be in trouble!! That is beautiful! Hope you sold it as a set. Christy, I love this so much. I’m doing a tray in pink for my granddaughter with milk paint not liking this so much I should of spray it, it’s too transparent. Aww, it’s precious! Pretty shade of pink, too! That little stool just completes it with its shapes reminiscent of toddler toys. That is absolutely gorgeous! I can picture a little girl so enjoying it! Bet it sells fast!! Soooo cute!! Love the color and some little girl will love it too! So darling! As a young girl, I would have loved having a mirror attached to the table. I loved trying on jewelry and hats. Make-up too, when I could get my hands on it. It is wonderful the way it is. Just reminiscing today. Christy, that is so adorable, I would have loved to have one just like that for my granddaughter when she was little, she would have loved it. SO adorable! Love the pink color! Looks like it might have a touch of peach? (In the ‘old days’ (the 80’s) we called it Salmon). Super cute! I would have loved to say at that table as a little girl. It’s adorable, love the color! You amaze, Girlfriend!!! Just adorable!!! Love the pink!!! I know I commented on IG but this is sooo cute!! 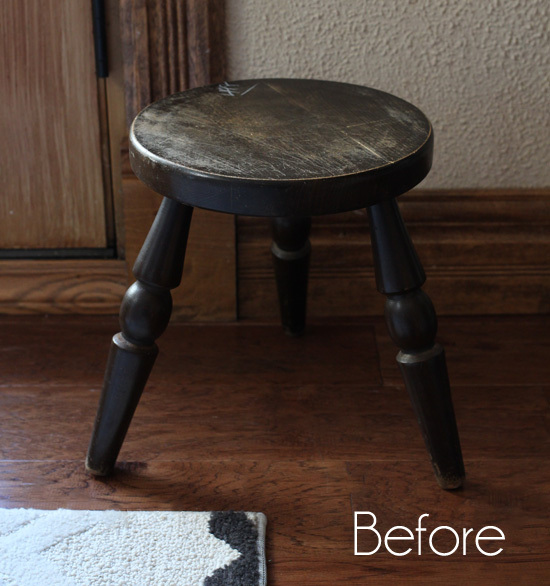 I just love the little stool. 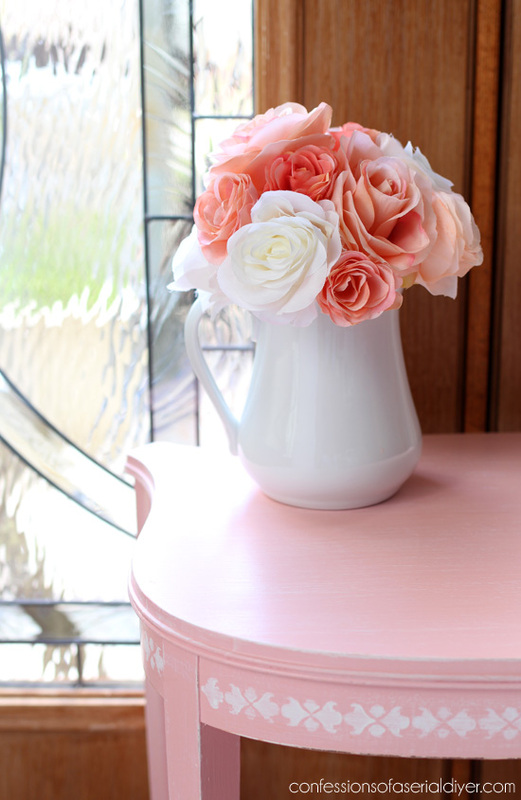 That pink paint on the vanity set is absolutely beautiful and you did a marvelous job on it. Love the stenciling also. Great job!